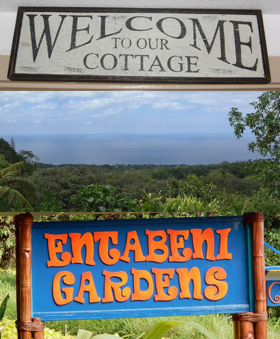 Entabeni Cottage is located above the world famous "Road to Hana" overlooking a wide expanse of the Pacific Ocean on the Hawaiian Island of Maui. Our gentle climate massages the body and soul of visitors who come to enjoy our tropical paradise. In the Zulu language in South Africa, entabeni means "the place on the hill with a view." In addition to Entabeni Cottage, our 6.25 acre property features Entabeni Gardens with our exquisite collection of 400 varieties of tropical and sub-tropical plants. See the EntabeniGardens.com website. • Michael Kristiansen, born in South Africa, has a degree in Landscape Architecture, Park Administration, Ornamental Horticulture, and is a Certified Arborist. Michael is a consultant in landscape management and horticulture, runs workshops in tropical horticulture, pruning, mulching, composting, docent training, and staff training. He is the past Director of the Honolulu Botanical Gardens and a long-time teacher at UCLA Extension in Landscape Architecture and Gardening and Horticulture. • Terry Kristiansen, manager of Entabeni Cottage, has worked with Michael for the past 48 years of their marriage and shares his love of nature, the tropics, and their 6.25 acre flower farm on Maui. We share our lives with our two sons and their families, three cats, a flock of chickens and guinea fowl. We grow flowers, fresh fruit and vegetables. We offer fresh eggs and produce to our guests. Mahalo (thank you) for visiting our web site. Please contact us for more information.